This salad is bright and fresh and super-uper delicious. But the dressing? Oh my. It’s really the star. 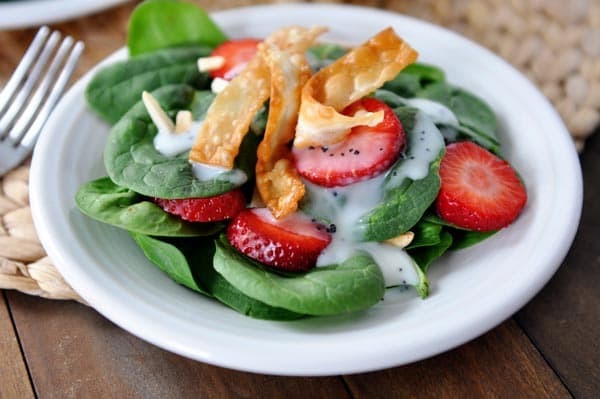 Sorry spinach and strawberries and almonds and even you little delightful crispy wonton strips. I’m just stating the facts. I wanted a fun, new salad for the upcoming Easter holiday (I got nicely ridiculed on Facebook for already planning my Easter menu, but really, how can you judge a girl who constantly has food on the brain?) and this is no question the salad that will be gracing our Easter dinner menu. 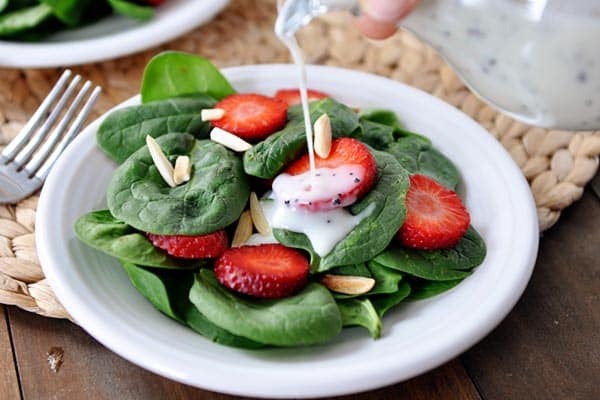 Strawberries and spinach are a match made in heaven, if you didn’t know. Toss those colorful beauties with toasted almonds and then drizzle with this divine dressing and you have a real winner. Oh, and if you really want to live life on the edge, crisp up some delicate wonton strips and throw those on top of the salad. Ohmyheavenlycombination. Let’s talk about this dressing for a minute. I’ve been playing around with a homemade creamy poppy seed dressing for a while now. I wanted to break away from the mayo-based salad dressings that are so popular. I like mayo in other things, in moderation, but I wanted this dressing a bit lighter – both in taste and calories. I am thrilled with how this dressing turned out with a bit of Greek yogurt for creaminess to play off the sweet tartness of the other ingredients. If you, like me, are worried that the yogurt might get a little weird (think: curdled) mixed with the vinegar. Never fear! If you add the ingredients together and immediately shake your little heart out – I mean it, shake, baby, shake! – then you’ll be just fine. The dressing is slightly thinner than commercial or mayo-based creamy poppy seed dressings but let me tell you, it is so perfectly sweet and tart and creamy and yummy, it will win you over. P.S. 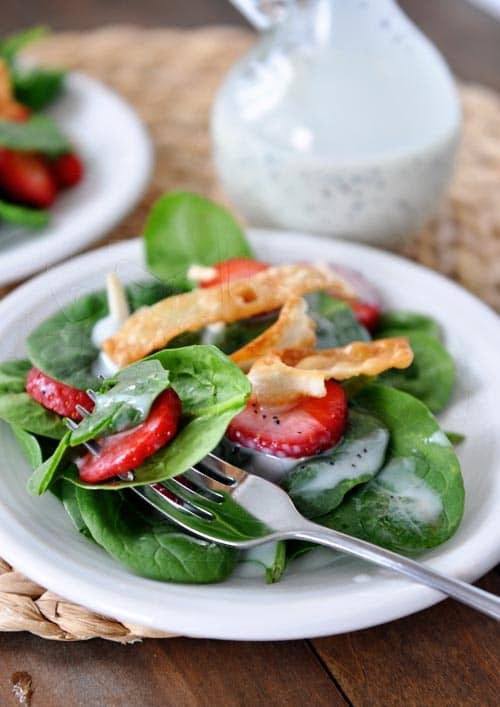 It would be delicious on just about any salad; it doesn’t just play favorites with this awesome combination of spinach and strawberries, although I highly recommend you start here if you want stellar salad of the year euphoria. For the salad, place the spinach in a large bowl. Top with the strawberries and almonds and lightly toss. For the dressing, combine all the ingredients together in a jar, close with a lid, and shake like crazy until well combined and smooth. You could also use a blender, but don't add the poppy seeds until all the other ingredients have been blended - stir in the poppy seeds at the end. Toss the salad with the dressing or serve the dressing on the side. The dressing will keep, well covered, in the refrigerator for at least a week. Serve the salad with crispy wontons on top, if desired. For the fried wontons, heat 1/2 cup or so of vegetable or canola oil in a stainless steel skillet until it is hot (and sizzles when you test a piece of the wonton). Cut small, square wonton wrappers into thin strips and fry in the oil until crisp, about 20-30 seconds each side. Remove to a paper-towel lined plate and sprinkle very lightly with salt. Let cool before topping the salad. If you don't have Greek plain yogurt, you can substitute non-Greek plain yogurt, however, it will make the dressing slightly more runny so be sure to drain off any excess whey/liquid before adding it to the dressing. Instead of using a number of cups of spinach, can you tell me the ounces instead? It’s very difficult to measure raw spinach. Do I push it into the cup, leave it loose? I never know! Do you think I could use Splenda in place of the sugar? Could definitely try – I haven’t tried it personally. Excellent! Love the dressing! Skipped the wontons cause I have celiac. This is a winner! Thanks! What can you do with leftover dressing? I recently attended an event and there were several batches of unused dressing. Any way to save or use it? You could always try freezing it?? How long will this dressing keep in the fridge if we want put it on a salad before eating? I made this for supper and was amazed at how light and fresh the dressing tastes. The best part was it got my 3 year old to happily eat spinach! I finally got around to making this dressing and salad today and I loved it! I passed the recipe on to my sister. Yum! This is a super easy and fresh salad. I love how I can make the dressing out of ingredients I have on hand, at home. I used plain yogert and and slotted metal spoon to drain the liquid. (couple of taps on the container) I have omitted the wontons for an easier recipe and also substitued chopped walnuts. Its so easy, I offered to make it for Easter. This is excellent! I ate it for dinner, and then had it again for dessert! I have made this dressing twice (doubling each time) in the last week. It’s been a hit, so thank you so much!! On Sunday I made it for an extended family dinner and I added a fresh orange chopped up to the salad because I was a little low on strawberries and it was so yummy!! Thanks for the great recipes as always! I’m making your Hawaiian haystacks with your reinvented sauce tonight. This looks great, and I can’t wait to try it. I would love to know what your Easter menu is for this year. I love all of your recipes, and I would love to make what you are making! Oh, I am so making this today! Thank you!! We usually use the bottled kind of poppy seed dressing on our spinach salads, but I like the idea of knowing what’s going into the dressing!! We usually add craisins, feta or mozzarella cheese, chicken, green onions, and chicken to bulk up the salad for a good lunch or light dinner. Thanks, Mel!! This looks so good and I love homemade salad dressing recipes too. I’m going to make this sometime later in the week! Yummy! We have this salad at Christmas because everyone loves it. This past Christmas I could not find organic strawberries so I used blueberries instead and it was delicious. Thanks for the dressing recipe; I’m leaning towards making all of my own dressings. Thanks for being such an incredible resource for recipes and meal-planning wisdom. Have a super week, and know that you are appreciated!!! This is one of our favorite salads. Thanks for lightening it up! Looking forward to trying it. Sometimes I add candied almonds to fancy it up, or even some feta or blue cheese. You’ve got to have some of the best recipes out there, love your blog! This looks wonderful! Do you think you could substitute honey for the sugar? I look forward to giving this dressing a try! Stacey – definitely worth a try to sub honey but I haven’t tried it so you’ll have to experiment. Good luck! All the cool kids are already planning for Easter, it’s true!! This is absolute Spring perfection! 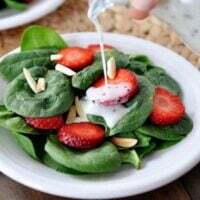 Spinach strawberry is my favorite-yum! I think this will be perfect for my rs Easter activity I’m in charge of…..now I need to look through your desserts to find the perfect Easter one for 60 women. Thanks for all the great recipes! I have a 10month old daughter who eats fabulous(everyone is amazed she loves healthy food and adult food) and I attribute it to you because your recipes are delicious! Thanks! This salad looks so lovely, and I love the lighter dressing! It will definitely be on our table often this spring! I was wondering if you have any food suggestions for General Conference weekend? Are there any traditional breakfast or dinner foods that you serve? I want to make the weekend special, but I don’t want to be so busy with meal preparation that I can’t enjoy listening to conference. I would really appreciate any ideas that you have! Thanks a bunch for all that you do!!!!!! Hi Janna – I completely know what you mean! Here’s my plan (these are kind of our traditions year after year): Saturday morning we do Eggs Benedict for breakfast. It’s the only time I make them all year. I don’t have a recipe on my site, but I use a basic hollandaise sauce and do a poached egg with canadian bacon on an English muffin. Then we always do ebelskivers for Saturday night. Sunday morning is cinnamon rolls that I’ve made weeks in advance and frozen (I take them out the night before to thaw and bake them in the morning) or that I make the night before and refrigerate and then I bake them the morning of. I also include a baked oatmeal or overnight steel cut oats, too. This year, I’m trying a new baked oatmeal with steel cut oats that you prep the night before, refrigerate and then bake in the morning (I’ll send the recipe to you if you like). Then for Sunday dinner, I’m doing a slow cooker meal (we usually do this Italian beef or BBQ pork and eat it on buns I’ve made and frozen and defrosted). We also have lots of healthy, fun snacks to eat that we normally don’t get – like fun fruits (I splurge on fresh berries or a different variety of apple) and we always do a variety of crackers and cheeses while watching. Hope that helps! Fools mock! This salad is going to make my Easter menu and maybe a time or two in between. Thank you so much! We have been making this salad for years. I like the sound of your dressing, we will have to try it the next time we make the salad. We always candy our almonds, (adding a crispy layer of sugar to the outside). It is very yummy. April – love the idea of candying the almonds! Definitely one of my favorite salads of all time. Can’t wait to pick fresh strawberries and then this will be on the menu A LOT. Beautiful photos! Have a blessed Monday, Mel! Oh, please continue planning Easter dinner! You are making it so easy for me to create my menu. Already I have a meal I can feel so good about serving — whole wheat high protein, lower carb dinner rolls and now this wonderful salad. You have taught me to live on the edge and be willing to come outside of the box experiencing new ingredients, So, I have never used wontons — where do you find them in the grocery store? Is this frozen dough? This week’s menu is so wonderful! Thank you for all you do and the excellent way you do it. Hey Sheila – usually the wontons are in the produce section, funny enough. In mine, they are near the cucumbers in a cool-climate case. I’ve also seen them by the refrigerated pastas in other stores. Hope that helps!